These homemade bagels are just 2 ingredients! The recipe doesn’t require any yeast or proofing. 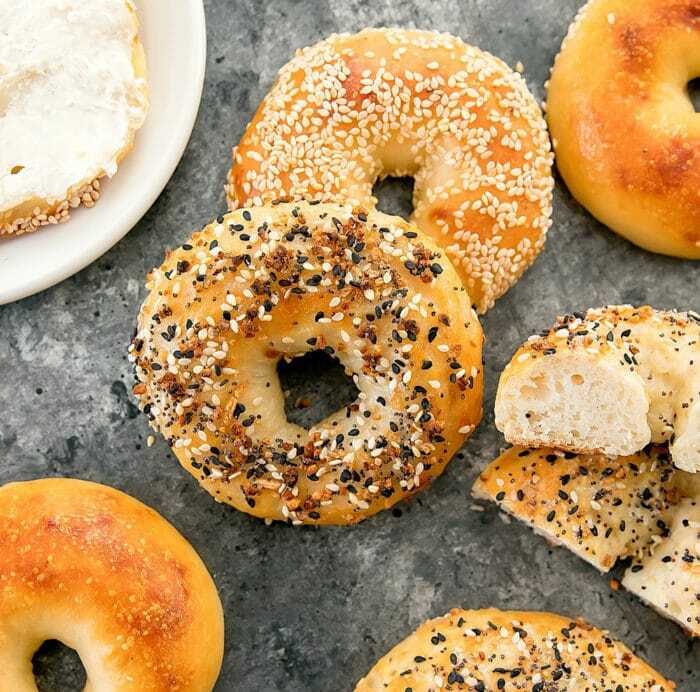 You can have fresh chewy and soft bagels in less than an hour. I am super excited to share this recipe with you today. I came across this easy bagel recipe recently and I immediately wanted to try it. This recipe combines two of my favorite things: recipes that are 4 ingredients-or-less and bagels! 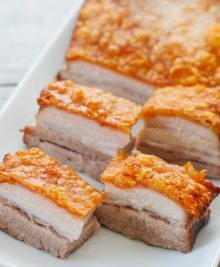 Apparently, this recipe has been popular in the Weight Watchers Community, though I found out about it from Skinnytaste. The two ingredients are plain nonfat Greek yogurt and self-rising flour (you can easily make your own if you don’t have self-rising flour.) 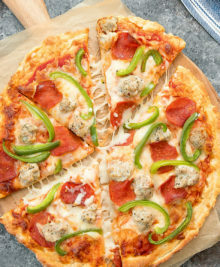 I previously made a super easy pizza crust with similar ingredients so this recipe looked promising. I have a serious thing for bagels. I spent my childhood in New York, where we ate bagels nearly every weekend. I miss NY bagels like crazy and always bring a few dozen back when I visit or ask for them when someone from NY is visiting me. These are not NY bagels. I didn’t expect them to be. But they do taste like a version of bagels and are surprisingly good. 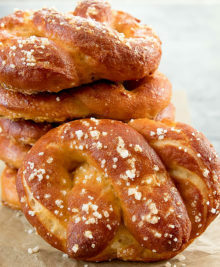 Much like traditional bagels, they have a thicker chewy skin and an airy and chewy interior. They do have a slight tangy taste from the yogurt. It makes them taste almost like sourdough bagels. These bagels don’t expand to be quite as large as traditional bagels but they are a great personal size. You can top with whatever toppings you like. I actually love my bagels plain but I also made some variations. 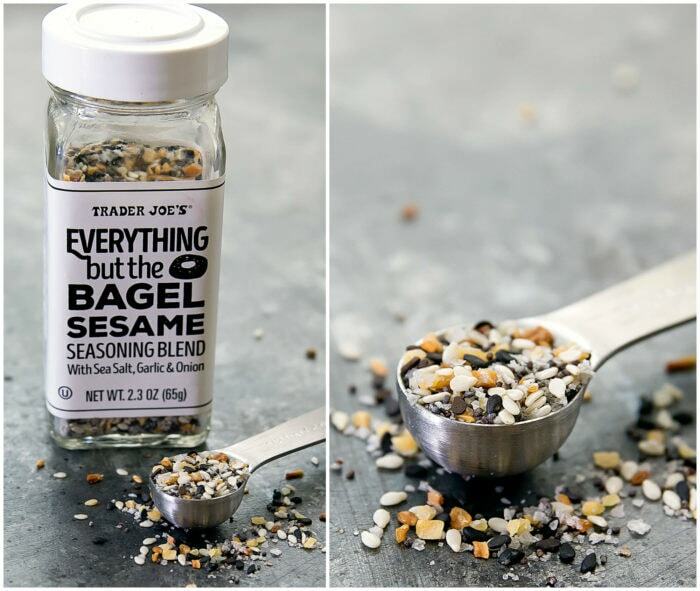 I knew that bottle of everything bagel seasoning from Trader Joe’s would come in handy! You can knead the dough by hand or use a stand mixer with a dough hook attachment. I prefer the stand mixer because it’s less labor and it doesn’t require as much flour coating so the bagel comes out lighter and airier. You do need to watch the mixer carefully. As soon as the dough comes together in one ball and is no longer sticking to the sides of the bowl, it’s ready. If you over-knead it, it will actually start becoming too sticky to work with again. Make sure you use a brand that makes a thick Greek strained yogurt. Not all brands offer the same consistency. I used Fage for these. Recipe now updated with video! You can view all my recipe videos on my youtube channel too. These shortcut homemade bagels are just 2 ingredients and take less than an hour to make. Preheat oven to 350°F. Line a large baking sheet with parchment paper or silicone baking mat. In a large bowl, add yogurt and flour. When measuring out the yogurt, make sure that you strain out any liquid. Any extra liquid sitting in your yogurt will cause the dough to be too wet. Using a large spoon or spatula, mix together flour and yogurt until it begins to form a crumbly dough. Use your hands to push the dough together into one ball. The dough will be very sticky. Add your dough to a stand mixer with a dough hook attachment. Knead the dough until it comes together in one ball and has pulled away from the sides of the mixing bowl. As soon as it reaches this stage, it is ready and you should stop the mixer immediately. (You can view my video above for reference). If you continue to let it knead, the dough will actually become sticky again. If you do not have a stand mixer, you can knead the dough by hand. You will need to cover your kneading surface with flour and knead the dough by hand until it is tacky and no longer sticky. I prefer using the stand mixer because it is faster and the dough comes together without the extra flour which results in a lighter bagel. Divide dough into four equal balls. Roll out a ball on a lightly floured surface until it becomes a rope about 3/4 inch thick. Try to make the rope as even and smooth as possible. Pinch ends shut to form a round circle. Repeat with remaining dough. 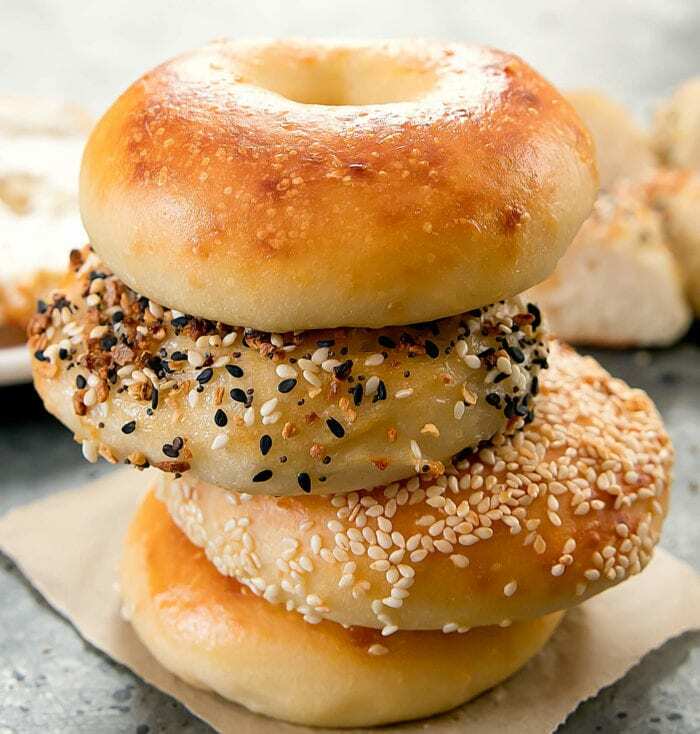 Place bagels onto a baking sheet. Brush tops with egg wash. Sprinkle tops with whichever seasonings you prefer. Bake bagels for about 23-25 minutes or until bagels are cooked all the way through. Remove bagels from the oven and turn heat up to 500°F. Place bagels back in oven and bake about 2-3 minutes until surface is browned. 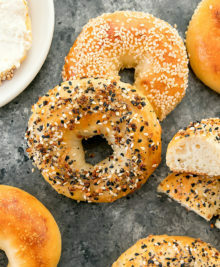 (If you are making plain bagels without toppings, you can also set your oven to low broil for 2-3 minutes to brown the bagels but I don't recommend this if you have toppings as the toppings will start to burn before the bagels finish browning.) Let bagels cool a few minutes before eating. A few recipes I found boiled the bagels before baking them. Traditional NY bagels are boiled first but I didn't feel that it was necessary for this recipe. While it did expand the bagels and make them bigger, they also took a lot longer to bake and they were not as smooth and round because of the boiling. You can knead the dough by hand or use a stand mixer with a dough hook attachment. I prefer the stand mixer because it's less labor and it doesn't require as much flour coating so the bagel comes out lighter and airier. You do need to watch the mixer carefully. As soon as the dough comes together in one ball and is no longer sticking to the sides of the bowl, it’s ready. If you over-knead it, it will actually start becoming too sticky to work with again. Because self-rising flour contains baking powder you do still have a leavening agent which makes the bagels quite airy. Hope you try the recipe! I can’t wait to try these! Right now, I have the Kirkland greek yogurt in my fridge; Costco used to have Fage in the larger containers, but it looks like they’ve switched it out now. I hope the Kirkland works fine. It looks like your recipe yields 4 bagels? Kirkland brand works! I recently started using that one too because Costco stopped carrying the Fage. The recipe yields 4 bagels. 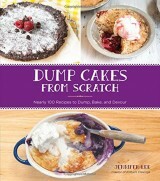 You can find the yield amount in the purple box that sits at the very top of the recipe box. Hope you like them! These are so easy it should be illegal. 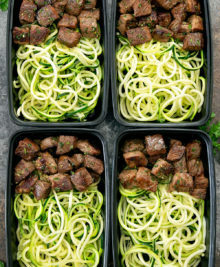 They look SO incredibly good- definitely need to try! it is definitely a great small batch recipe! I hope you enjoy! Aack! Guess I didn’t see that box at the top of the recipe. 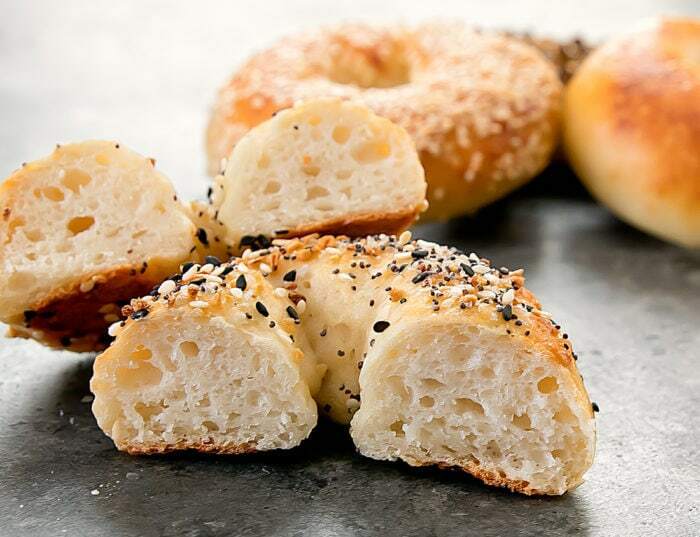 Is there a particular place in New York that you like for bagels? I was in NYC recently, and really liked the bagels from Ess-A-Bagel (after waiting for 45 minutes!). No worries, a lot of people miss it! I’ve heard so many good things about Ess-A-Bagel though I’ve never been. Our go-to spot is Brooklyn Bagel & Coffee Co. (though the store isn’t actually in Brooklyn). They don’t usually have too long of a wait and I like that their bagels are constantly hot and fresh. They have a few dozen cream cheese spreads to choose from too. Pro tip – don’t wait in line. There’s a separate line towards the back where you can pick them up! You can ask for the cream cheese on the side 😉 I work close by so I’m in and out of there a couple times a week. Omg i love bagels, and this recipe sounds amazing. will give it a go sometimes this week. Ania, I love how you typed “sometimes” ? I’ve also tried a few times, this week, and it’s only Wednesday – third batch, this week?? These are so amazing! Thank-you for the recipe ? Hi I just made these with my mixer…Thanks for the idea! Mine didn’t turn out like yours though, mine were doughy in the middle. How long should I use the dough hook on the mixer and what speed do you recommend? I’m thinking that is where I went wrong….. I mixed mine on medium speed. You should mix until the dough turns into one ball and pulls away from the sides of the bowl. The dough should feel tacky but workable. You do need to be careful not to overknead the dough because then it will be sticky again. 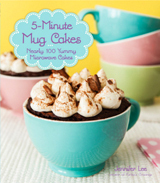 Perhaps you also just needed to bake them a little longer? And make sure you strain out any wateriness from the greek yogurt. I hope that helps! What do you put first in the stand mixer? The flour or the yogurt? I felt these dough hook did t scrape the bottom of the bowl enough. I put flour and the. Yogurt. I’ve done it both ways. I haven’t had issues, but if you feel your dough hook isn’t reaching, you can always help it along manually using a spatula to help mix. fridge or freezer and then toast them! they are in the oven! what a fast way to make bagels. thank you for sharing! I hope they turned out well! Hi! I’m a native New Yorker who now lives in Spain and can’t even get mediocre bagels let alone good ones. I was so excited to see find this recipe but the greek yogurt I have access to is closer to the texture of sour cream rather than Fage. Any suggestions on how to counteract the extra moisture?? Sorry I don’t know the answer to that. I feel your pain though. My only thought would be to make your own Greek yogurt. I know a lot of people have been making them with an Instant Pot or yogurt maker but I’ve never tried it myself. Just strain it a bit longer. You can do this with cheese cloth or paper towels. Line a strainer with one of these over a bowl. Place the yogurt in the strainer and let sit in the fridge for a few hours or overnight. This should remove some of the moisture and help thicken it up. I cut little slits in mine before baking and added blueberries. To others, I added cinnamon and sweetener on top. Both gave the bagels a nice taste. Hi, I grow my own yeast to make sourdough recipes. Can i use that somewhere in this recipe? Any chance I can use oat flour and add baking powder to make it rise? I just tried mine with oat flour added in baking powder and salt, they didn’t rise at all. Have another batch in the oven but oat flour with fast rising yeast with my fingers crossed…. If these don’t turn out, I think I’ll switch to a different flour. If I make extras that need to be stored for a day or so should I store in the refrigerator because of the yogurt? Bagel fail! I had it in the stamNd mixer for less than a minute and it turned into a gloppy mess. How long do you usually hand yours in for? Sorry to hear that. You should only have it in the stand mixer until the dough becomes one ball and pulls away from the sides. As soon as it reaches that stage, it should be ready to go. If you keep overkneading, it will actually turn sticky again. Also make sure you are using the knead hook and not the regular beaters/mixers. I’ve been making these with KA bread flour, and while they’ve tasted great, I just want to make sure they’re rising and expanding as much as they should. Once baked, is it correct that these bagels are about 3” in diameter and about 1.5” high? Basically around the same size as a “mini” bagel? If they’re supposed to come out larger, I’ll need to try a different flour. Sorry I didn’t measure the bagels but that sounds close to what they should be, though maybe slightly on the small side. I think mine were slightly bigger and taller, but I think as long as they taste great to you, it shouldn’t matter too much! Can you use whole wheat flour?? Hi, jumping in here. 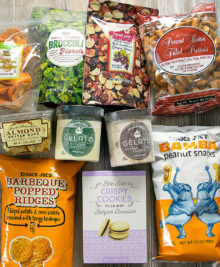 On Skinnytaste she breaks down the nutrition for these, I believe she has listed carbs as 26.5. That’s the plain version, may change if you add toppings. I like Kirbie’s directions better so I nipped over here. Can i use whole wheat flour instead? I have not tested it myself, but others have tried and had success! Made these and they turned out delish but very sour! Can you please help! As I indicated in my post, these bagels are supposed to have a sourdough-like flavor because of the yogurt. You can reduce the tang by using a yogurt that is less sour. For instance, I have tried this with both fage and the Kirkland/Costco yogurt brand. The Kirkland yogurt has noticeably less sour flavor so the bagels come out with a much more subtle tangy flavor. The toppings you put on the bagels can also help mask the sour. The everything seasoning I thought was the best way to hide some of the tanginess. hope that helps! I made mine with SKYR whichhas a similar consistency to Greek yogurt, but it is slightly thicker and milder tasting without the sourness and turned out wonderfully. 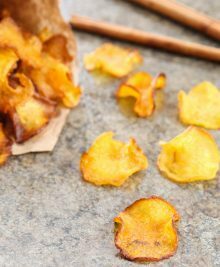 Would this work with gf flour and coconut yogurt? No it will not unfortunately. I tried with 3 Tbs coconut flour and 3 Tbs regular flour, delicious but flat! the flour substitution probably caused the flatness, but I’m glad you got it to work! I really like these, especially as a pre or post run snack! But, they are a little too tangy for me. I used a store brand plain greek yogurt, but am wondering if I could add a dash of sugar or honey to cut the tanginess. I’m not worried about the sugar content at all. As long as they still have protein, I don’t care! I think that should help. Also the brand of yogurt makes a difference too. My current favorite is Kirkland which isn’t as tangy as some other brands. I used whole wheat pastry flour and mixed by hand. The bagels turned out great! Thanks much! I’m glad these worked out for you! Can you double or triple the recipe and freeze the dough for future use? I have not tried doing that so I’m not sure how well the dough freezes. Absolutely! I cut mine in half before freezing them so they are easier to toast in the morning. Then I pop them into a Ziploc bag and into the freezer. Made them today. Did not look like picture. Made them too thin. Still good. unfortunately the comments section does not support picture uploads, but you can share your picture through Instagram or facebook. If you had to add a lot of flour when rolling out the dough, the bagels will rise less but should still taste good. You can make your initial bagel ropes thicker if you find your bagels aren’t rising as much during baking and then they won’t be too thin. Hey! I made these the other day with dairy free yogurt and whole wheat flour and they were awesome! I am wondering normally though, how long would they stay good for in the refrigerator? they should be good for 2-3 days in the fridge! What kind of dairy free yogurt did you use? I am trying to make a vegan version of this. Can u add fruit to these? Like to make blueberry bagels? I’m allergic to eggs. Is there something else I can coat them with to make toppings stick? Thanks! I’m excited to try these with my little kids. 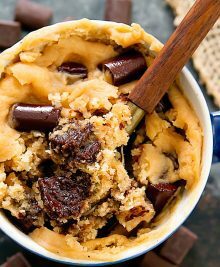 Is there a way to use this basic recipe and add something to make chocolate dough thought I would ask before expirimenting. This is a great recipe. I used a 5 ounce container of strawberry Greek yogurt and 3 ounces of plain Fage. 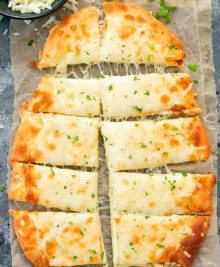 These were wonderful and so easy! Thanks for the recipe and your attention to all the comments, you’re very involved! I’m so glad these worked out well for you! Hi! 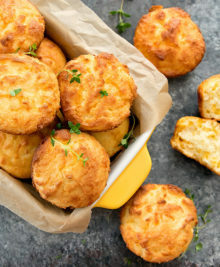 I have made these and love them when they are right out of the oven but I was wondering if the dough would keep well in the fridge overnight so I could make fresh bagels in the morning the following day as well? I am so pleased with the way these turned out! Thank you for sharing such a wonderful recipe, it’s made a world of difference in my morning meals. Yum! I’m so glad you are enjoying these! 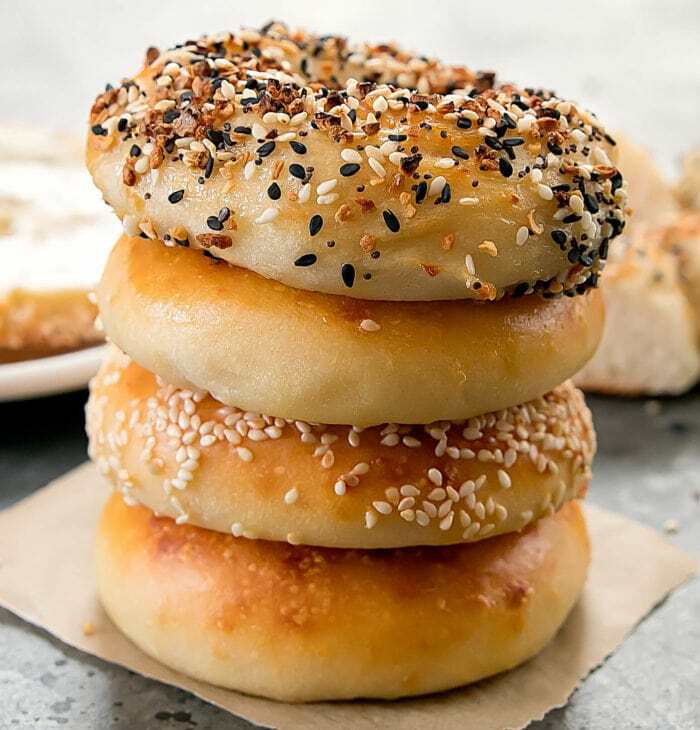 Is there a keto version of these, I LOVE bagels. These didn’t exactly work for me, but I’m willing to try again. They looked great, but even after baking them 10 minutes longer than the recipe called for they were still doughy on the inside. I couldn’t leave them in the oven any longer or the bottoms would have burned. THE yogurt I used was very thick so I don’t think that was the issue. The dough wasn’t easy to handle when I shaped it, so not sure where I went wrong. I’m going to try again with fresher baking powder. It sounds like maybe a little too much moisture in your dough. If your yogurt is at all watery, make sure to remove that liquid. Baking powder can also affect the bagels from rising properly if your baking powder is old. I love them and make them weekly. You can also add 1 Tablespoon Cinnamon and 1/8 Cup Raisins for cinnamon Raisin bagels and leave off the everything bagel topping. thanks for sharing your variations! Will these be good for a day in an airtight container? Amazing! Followed the recipe to the letter, and they were fab. haha, thank you for trusting me! So glad these turned out well for you! I made these and they are fantastic. I was just curious why the sodium is so high though. I know that there is sodium in the Greek yogurt but not that high. Just curious if you knew. But they are just so totally yummy. And definately the yogurt gives it a tang just like sourdough bread. Most of the sodium is coming from the self rising flour which already has salt added to it. I’m glad you like the recipe! Delicious – just made some for my wife as a Christmas present! However, because I don’t have a stand mixer, this rapidly became a sticky and gooey mess. The yogurt I have here in South America is not particularly watery, but I used at least one additional cup of flour to get to being able to work the dough – and it was still almost too sticky to be able to work with. 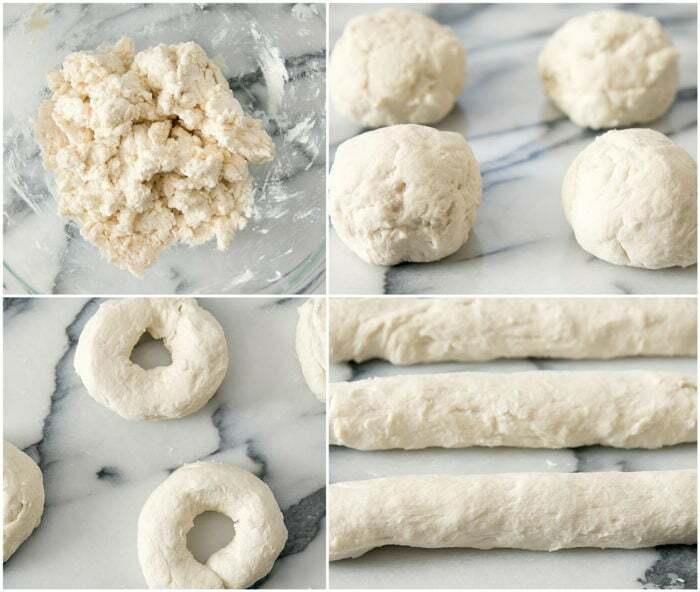 Which makes me curious: have you actually made this recipe hand-kneading the dough? It can definitely be done hand kneading though I prefer using a machine. I’m so sorry to hear that. Unfortunately, without being there, I don’t know where exactly the recipe went wrong for you. One thing to keep in mind is that the dough does not need a lot of kneading. When you add the flour, it should stop being sticky quite soon. And if you continue to knead, it will actually become sticky again, so you need to be careful not to knead it too much. I’m wondering if almond flour would work. Have you tried that? Trying to cut out some of the carbs. 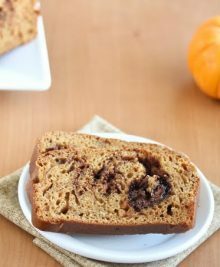 Could I substitute the flour with almond, coconut or sesame flour, and if so, to what ratio? Hi . I just made theses this morning and OMG!! So yummy! ! But the only thing is that the inside looked like it wasn’t done, an I baked them for 25 Min like said on recipe. ..help what did I do wrong? Thank you hun.? You might try leaving them in the oven just a little longer. Cooking time can vary from oven to oven.